We’ve successfully moved into our new house now and the work to improve it has begun in earnest. 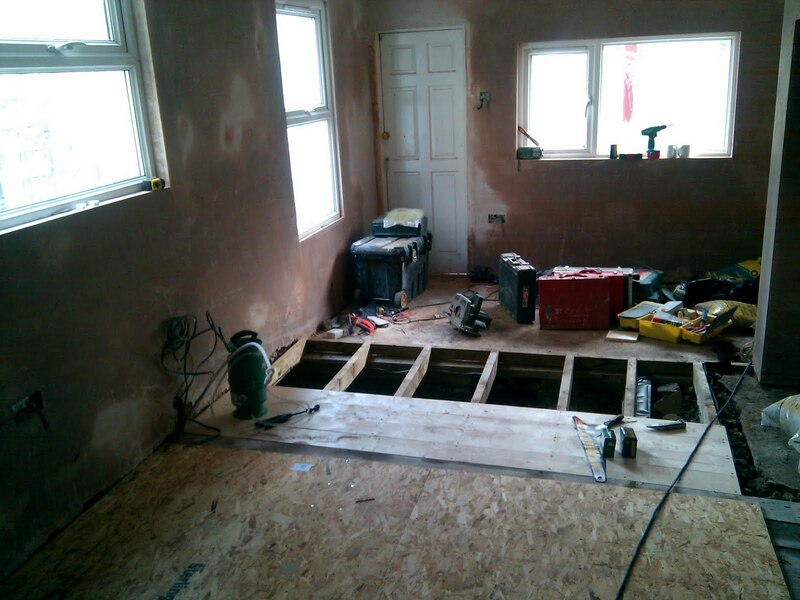 The previous owner had made only one alteration since moving in twenty years ago – a new bathroom – so most of the house looks very dated and some of it is defective. 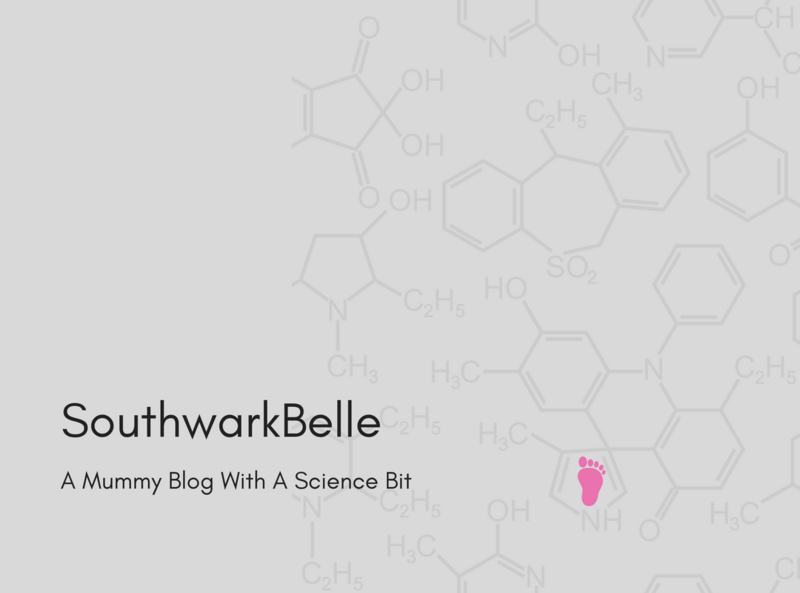 We can live with the dated stuff for a while and gradually redecorate, but with a baby who is on the verge of moving under her own steam, it was important that we get anything dangerous fixed quickly. The top priority was Evelyn’s bedroom, where the old Victorian ceiling was seriously bowed and risked collapsing. 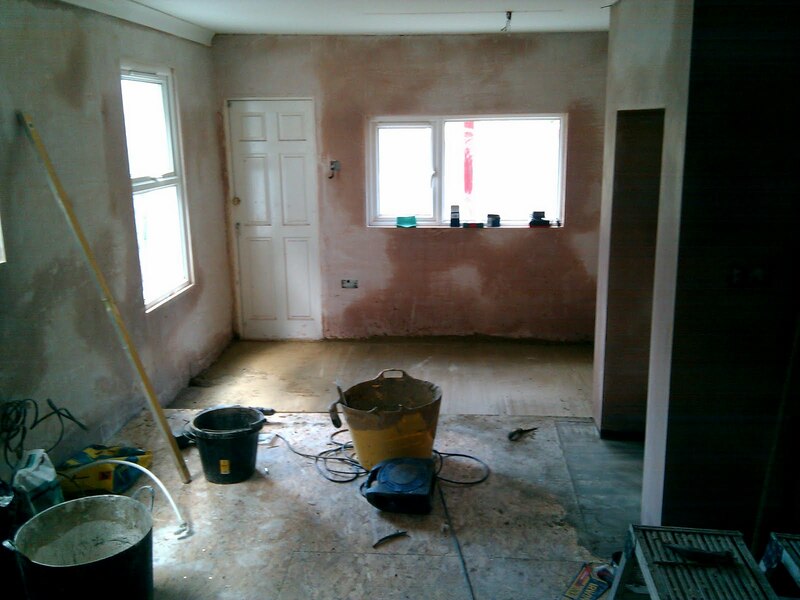 After some pretty foul dust, and even fouler language from our Saaarf Lahndan (South London) builders, the room now has a new ceiling and the walls have been stripped. They start painting today, so the job should be done by the end of tomorrow. This will be a huge relief, as Evelyn has been waking up very early whilst she’s been sleeping in our bedroom. And it will be lovely for her to have a room of her own, rather than study/store room/baby bedroom. By the end of day two the wiring and gas pipes were fixed, the plumbing was half done and the missing bit of wall was replaced (look at the left most window: you can see how much was missing by the amount they had to replace). The builders had also raised the lintel in the chimney (right hand side), to create space for the cooker and cooker hood. Again, I can’t believe how quickly they did all this. While all this is going on, Kirsty and Evelyn have escaped to stay with Granny (very wise). I am still living in the house, surviving on a fridge freezer and microwave in the dining room, washing dishes in the bathroom sink and to be honest mostly living off takeaway. Fortunately the weather has been wonderful, so I can enjoy the lovely garden which – unlike the house itself – the previous owner took great care of. 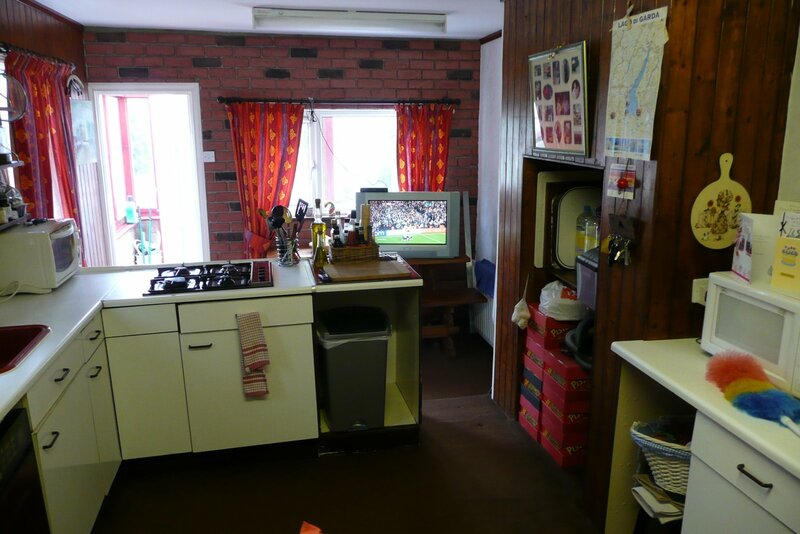 I’ll try to keep posting a photo of the kitchen each day. Sorry I have failed to do daily updates. Here are some more photos. 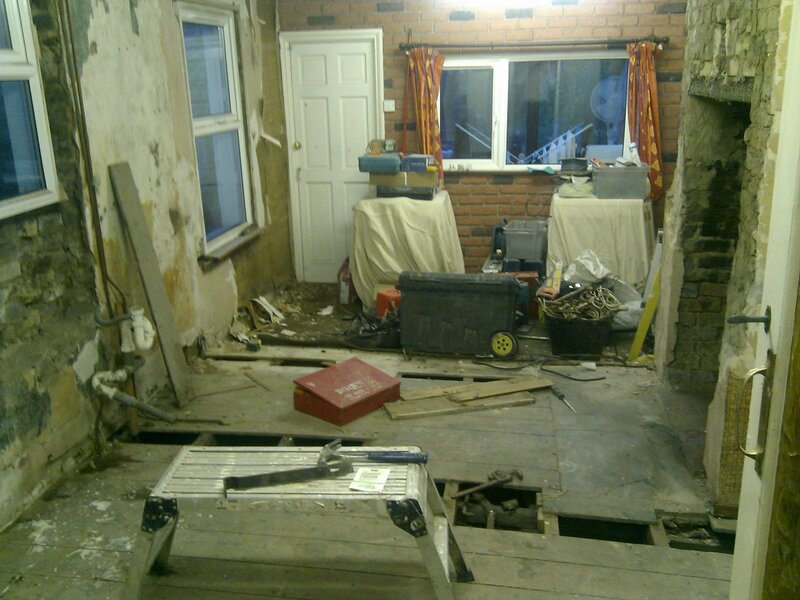 After day 4 the hideous fake brick tiles had come off the end wall and even more floor had been removed. By day five the end wall and the whole side wall had been redone. And by the end of today, day 6, the walls were done and the floor was starting to come back together again. But you’ll just have to take my word for that as the builders have also disconnected the lights and it’s after dark now. Today a nice Polish plasterer came. Now we have walls that are straight at last. 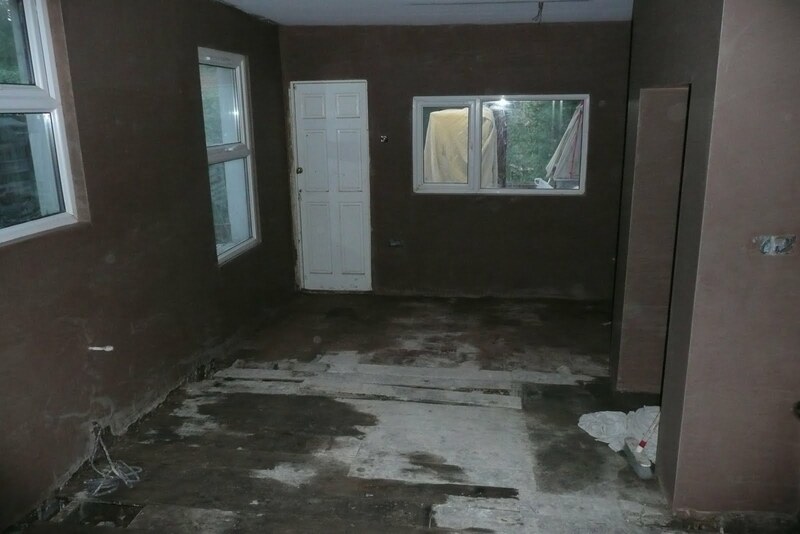 There also seems to be a bit more floor, but there’s still more to do. The builders are back tomorrow. Work has been continuing for the last few days. More problems have been found, and thankfully resolved. 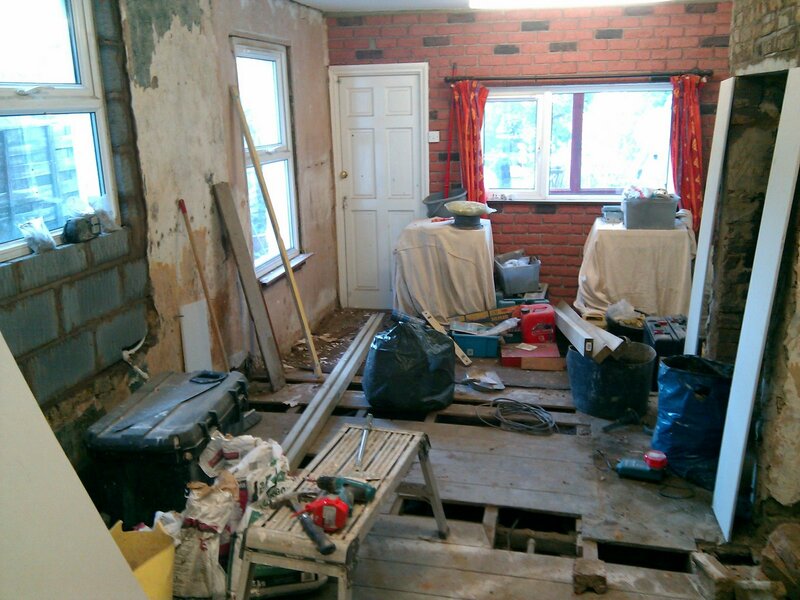 It turns out that not only were the floorboards and joists rotten, the bricks underneath them were too. 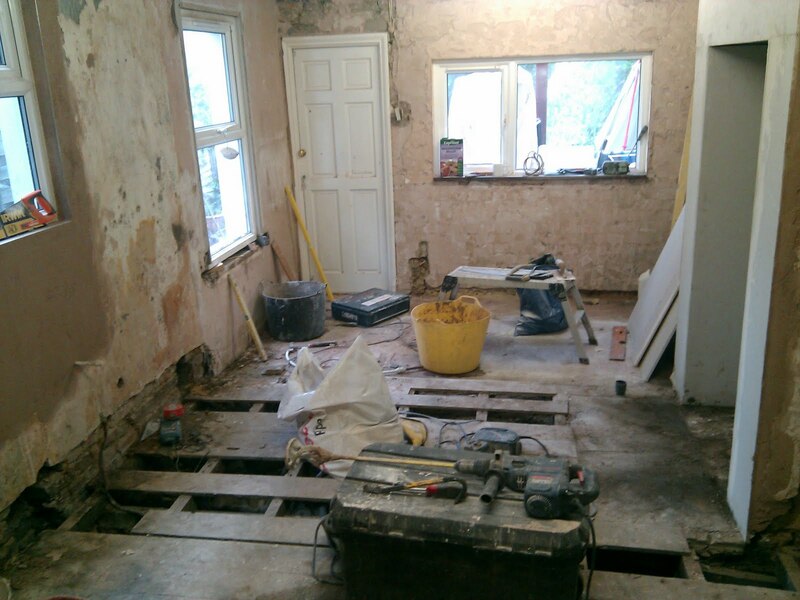 Here is the kitchen on 30 June, as the floor and all its supports were being removed to get to the bare earth. 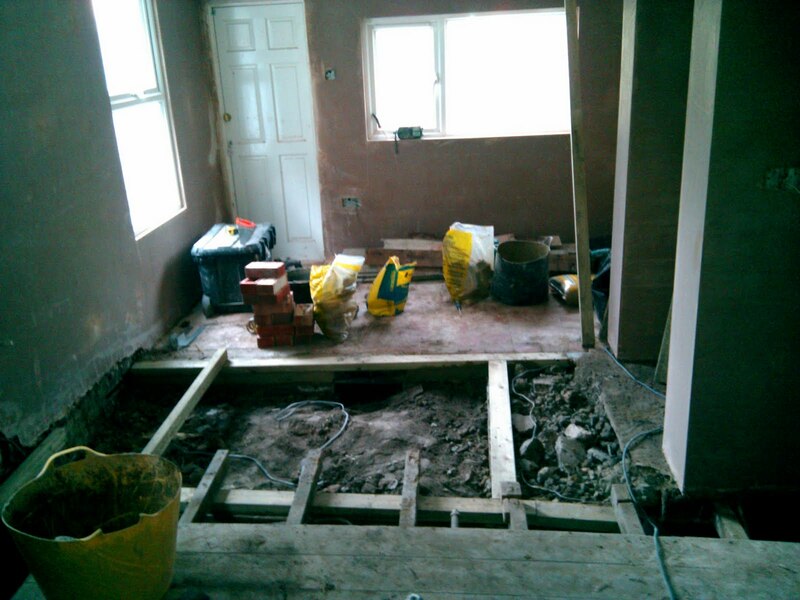 A day later the bricks have been rebuilt, the joists replaced and most of the floor is down. And by the end of the second week of work, on 2 July, the floor had been completed. 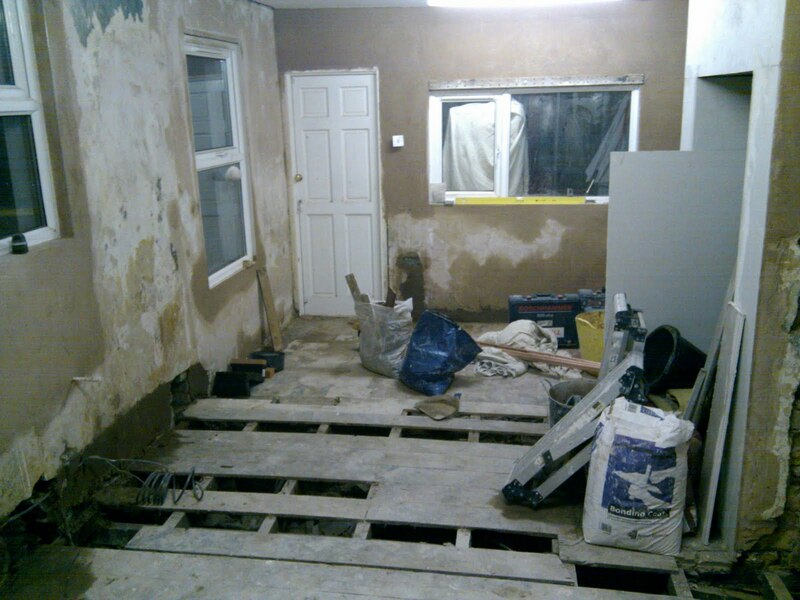 Who’d have thought it would take that long to get the room into a state where it was ready to have a kitchen put in it?! The morals of this story is that if you have a leaky tap don’t wait 30 years to get it fixed, and if you have your floor relaid, make sure there’s proper damp proofing in it. Or something like that. What do I know about building?! 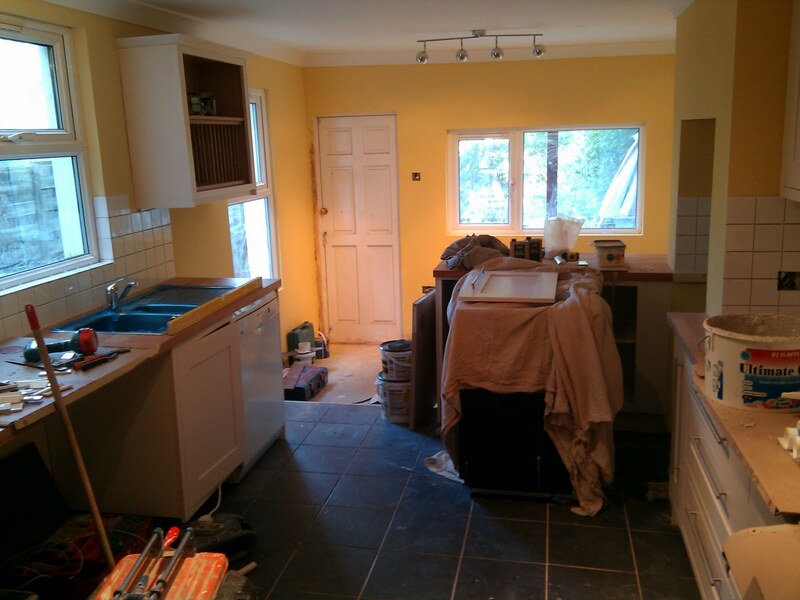 Work is still continuing in the kitchen, and is about to enter its fifth week, but now the end is in sight. 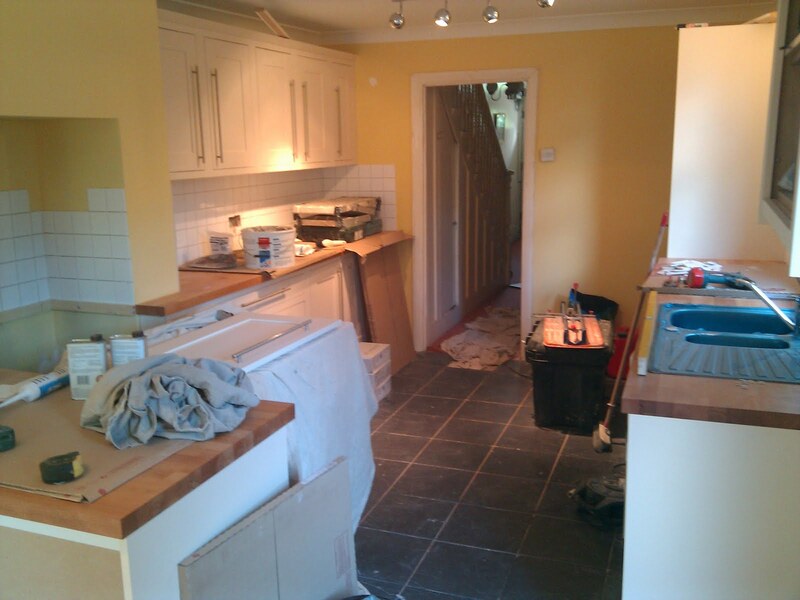 The floor and walls have been tiled and had their first coat of paint, the kitchen units are in, as are the worktops and the appliances. Here are some pictures from Wednesday 14th.